Mercedes-AMG GmbH, commonly known as AMG, is the high-performance brand used by Mercedes-Benz. AMG independently hires engineers and contracts with manufacturers to customize Mercedes-Benz AMG vehicles. Mercedes-AMG is headquartered in Affalterbach, Baden-Württemberg, Germany. AMG was originally an independent engineering firm specializing in performance improvements for Mercedes-Benz vehicles; DaimlerChrysler AG took a controlling interest in 1999, then became sole owner of AMG in 2005. Mercedes-AMG GmbH is now a wholly owned subsidiary of Daimler AG. AMG models typically have more aggressive looks, a higher level of performance, better handling, better stability and more extensive use of carbon fibre than their regular Mercedes-Benz counterparts. AMG models are typically the most expensive and highest-performing variant of each Mercedes-Benz class. AMG variants are usually badged with two numerals, as opposed to regular Mercedes-Benz vehicles, which have three (e.g., C 63 as opposed to C 300) The numbers do not always indicate engine size accurately, but are rather a tribute to earlier heritage cars such as the 300SEL 6.3 litre, for example previous model AMG V8s such as the C63 actually had 6.2L V8s. 3.10 "60", "73", "70", "55"
AMG was founded as a racing engine forge in 1967 under the name AMG Motorenbau und Entwicklungsgesellschaft mbH (AMG Engine Production and Development, Ltd.), by former Mercedes-Benz engineers Hans Werner Aufrecht and Erhard Melcher in Burgstall an der Murr, near Stuttgart. The letters "AMG" stand for Aufrecht, Melcher and Großaspach (Aufrecht's birth town). In 1976 most of AMG moved to Affalterbach, with the racing-engine development remaining at the old location in Burgstall. At this time Erhard Melcher ceased to be a partner, but continued to be an employee at the Burgstall location. In 1993, with AMG having become a high-profile purveyor of modified Mercedes-Benz cars, Daimler-Benz AG and AMG signed a contract of cooperation, allowing AMG to leverage Daimler-Benz's extensive dealer network and leading to commonly developed vehicles (the first one being the Mercedes-Benz E50 AMG, in 1993). On 1 January 1999 DaimlerChrysler, as it was called between 1998 and 2007, acquired 51 percent of AMG shares, and AMG was renamed to Mercedes-AMG GmbH. Racing engine development was divested and continues to exist in Burgstall under the name HWA (Aufrecht's initials). On 1 January 2005 Aufrecht sold his remaining shares to DaimlerChrysler, and since then Mercedes-AMG GmbH has been a wholly owned subsidiary of Daimler AG. AMG started off by designing and testing racing engines. It expanded its business into building custom road cars based upon standard Mercedes cars. AMG initially produced a range of unofficial upgrade and accessories packages mainly for the Mercedes-Benz R107 and C107 (1971–1989 SL roadster), Mercedes-Benz W116 (1972–1980 S-class), Mercedes-Benz W123 (1976–1985 E-class), Mercedes-Benz W124 (1984–1997 E-class), Mercedes-Benz W126 (1979–1992 S-class), Mercedes-Benz R129 (1989–2001 SL roadster), and Mercedes-Benz W201 (1990–1993 C-class) models. During the early 1980s and up until 1990, AMG offered a variety of engine performance packages, alloy wheels and styling products as an entirely independent company from Daimler-Benz. In 1990, AMG signed a co-operation agreement with Daimler-Benz, and AMG options and cars were then offered in Mercedes-Benz showrooms; in 1999 Daimler AG, then known as DaimlerChrysler AG, bought the controlling share of AMG and made them part of the official Mercedes-Benz line-up. Typical AMG performance enhancements, which the buyer could custom order, included increased engine displacements (5.2 litre, 5.4 litre), performance top ends with port and polished heads and intake, lightened valve train, and more aggressive cams. The DOHC 32V engine had also just been developed and was the pinnacle of AMG performance. A Getrag five-speed manual transmission could be ordered from AMG, and Mercedes had not offered a manual transmission V8 since the early 1970s. The performance wheels offered during the same period were 15-inch or 16-inch ATS AMG Five Spoke Road Wheels, commonly referred to as Pentas. Penta was actually a UK-based company that supplemented the high demand for the AMG wheel at the time with a replica and only a very slight styling difference, but they were not made or endorsed by AMG. The genuine AMG wheels were often coupled with an AMG performance suspension package that included uprated and lowered springs, and re-valved shock absorbers. Another popular cosmetic upgrade were the AMG body kits. These ranged from subtle front spoilers, to an aggressive Wide Body kits for the W126 coupes. Other options included Recaro seats, smaller diameter steering wheels, instrument clusters, chrome delete option (all brightworks colour-coded or painted satin black), refrigerators, shift knobs, hi-fi stereo systems, custom upholstery and enhanced interior wood packages. The release of the AMG Hammer sedan in 1986, based on the W124 E-Class, took AMG's performance modifications for a fast midsized sedan to a new level. AMG made the world's fastest passenger sedan at the time, nicknamed the Hammer, by squeezing Mercedes 5.6-litre V8 tuned by AMG to 360 hp into a midsized sedan. It was very aggressive for the era, with 32-valve cylinder heads and twin camshafts, and said to be faster than the Lamborghini Countach from 60 to 120 mph. Later models were even more powerful and introduced the 17-inch AMG Aero 1 Hammer wheels. 1986 was also the year Mercedes introduced the 560 M117 engine. This provided yet another opportunity for customers to order the largest AMG displacement available at the time, the 6L 100 mm bore SOHC or DOHC engines available for both the W126 coupe and sedans. Through the early 2000s, AMG focused principally on supercharged V8 and V6 engines, but the company officially abandoned this technology in 2006 with the introduction of the naturally aspirated 6.2 L M156 V8. On 16 January 2006, Mercedes-AMG Chairman Volker Mornhinweg told AutoWeek that the company would use turbocharging for higher output rather than supercharging. For 2011, AMG released the M157 5.5L biturbo V8, which has supplanted the M156 in its full-sized cars such as the S-Class and CL-Class (and is trickling down to the CLS, E-Class and ML-class). In 2012, Mercedes-AMG Chairman Olla Kallenius said that Mercedes-AMG will not produce diesel engines to compete with BMW's tri-turbo diesels (BMW M Performance range). Although there were some AMG models in the 1980s with manual transmissions, almost all recent models have used automatics (5G-Tronic and later 7G-Tronic with Speedshift), in contrast to BMW M, which used manuals and recently semi-automatic transmissions (the current type being a dual clutch transmission). Starting in 2009, however, AMG began adopting the seven-speed AMG SpeedShift MCT automatic transmission. Although these are considered the most well known in-house tuning divisions, Mercedes-AMG has a considerably different philosophy than BMW M. Compared to BMW M, Mercedes-AMG is "less narrow in its sporting focus, yet still combining sledgehammer performance with relaxed handling, cultured comfort, and practicality". While founders Hans Werner Aufrecht and Erhard Melcher had emphasized proper racing cars, Mercedes-AMG had diverged considerably from this philosophy in recent years, with their offerings being well known for straight-line acceleration but poor handling dynamics. However, current Mercedes-AMG chairman Volker Mornhinweg has urged the division to return to its roots of building sports cars. In the late 1960s and early 1970s, AMG entered the big Mercedes-Benz 300SEL 6.3 V8 saloon, affectionately named the "Red Sow", in the 1971 Spa 24 Hours, and the European Touring Car Championship. AMG and Mercedes worked together on Mercedes-Benz W201 cars for the 1988 Deutsche Tourenwagen Meisterschaft (DTM, German Touring Car Championship). AMG was made the official partner. When DaimlerChrysler acquired a majority share of AMG in 1999, the motor racing department was divested into HWA AG. Their first car was the ill-fated Mercedes-Benz CLR. Since 2000, HWA builds and runs the cars for Deutsche Tourenwagen Masters (DTM), as well as the M271 engine tuned for use in Formula 3. Six successive lightly modified Mercedes-Benz AMG models (including, most recently, an SL 63 AMG) have acted as the safety cars for the FIA Formula One World Championship. Since 2010, the Mercedes-Benz SLS AMG GT3s has been competing in GT competitions around the world, such as the FIA GT3 European Championship, Blancpain Endurance Series, Blancpain Sprint Series, VLN, 24 Hours of Nurburgring, British GT Championship, Super GT, Australian GT Championship, Bathurst 12 Hour, Dubai 24 Hour, Macau GT Cup and Pirelli World Challenge. In late 2011, after the end of the Formula One season, Mercedes GP Petronas announced that it would be using the AMG branding for its F1 efforts, changing its name to Mercedes AMG Petronas for the 2012 season onwards. Three AMG E-Class V8 Supercars competed in the Australian Supercars Championship from 2013 to 2015, operated by Erebus Motorsport under the AMG Customer Sports Program. AMG also provides engines for the Zonda and Huayra cars. The M297 7,291 cc displacement V12 engines were originally used in the 1995 SL73 AMG. It is the largest displacement naturally aspirated engine provided by AMG and is now exclusively used by Pagani. On July 25, 2013, Aston Martin Lagonda Ltd and Daimler AG announced moves towards a technical partnership with Mercedes-AMG GmbH. The deal will see Aston Martin access significant Mercedes-AMG GmbH and Mercedes-Benz Cars' resources, allowing the development of bespoke V8 powertrains and the use of certain components of electric/electronic architecture. Daimler AG now owns a stake of 5% of non-voting shares in Aston Martin, joining existing shareholders Investment DAR, Adeem Investment and Investindustrial. The technical partnership will support Aston Martin's launch of a new generation of models and newly developed bespoke V8 powertrains. All AMG engines - with the exception of the "35" M260 2.0 L Inline-4 Turbo and "43" M276 3.0 L V6 Bi-Turbo engine, as well as various other "43" and "53" models using the new M256 inline 6 engine - are hand built using a "one man, one engine" philosophy at the current AMG plant in Affalterbach, Germany. To signify this, each AMG engine builder stamps the engines they produce with an engraved plaque depicting their signature. According to Mercedes-Benz, there are only about 50 AMG engine builders. The 2.0 L Turbo I4 was created for use in the smaller, 45 AMG models, such as the A-Class, CLA-Class, and GLA-Class, which all share the same platform. The M133 (2015 onwards) produces 381 PS (375 HP) and 350 lb-ft (475 Nm), making it the most powerful turbo 4-cylinder in production, and with a 190.5-horsepower per liter, one of the most power dense engines in production. Models with the M133 Turbo 4 are paired with a 7-speed AMG SPEEDSHIFT Dual-Clutch Transmission. The CLA45 AMG can accelerate from 0-60 Mph (0–97 km/h) in 4.2 seconds, according to Motor Trend's first test of the vehicle. With the launch of the 3.0-l V6 gasoline engine with direct injection and twin turbo- charging, called M276 DELA 30, a new member has been added to the approved M276 V6 gasoline engine series. These are powered by the new Mercedes-Benz M 256 inline six cylinder engine. Rumoured in 2009 and confirmed in 2010, AMG developed the M157, a 5.5-litre V8 with direct fuel injection and twin turbochargers. Power is rated at up to 577 bhp (430 kW; 585 PS) at 5,250-5,750rpm with a peak torque of 664 lb⋅ft (900 N⋅m) made between 2,000rpm and 4,500rpm (the amount of power and torque depends on model, but these are the maximum ratings). Both engines are mated to Mercedes-Benz's 7-speed MCT transmission. Unlike the M156 naturally aspirated 6.2 L V8, which was developed entirely within AMG, the M157 is based upon the M278 used in the regular Mercedes-Benz S-Class and CL-Class. The M157 boasts 25% better fuel economy (10.5 litres per 100 kilometres versus 14.4 L/100 km in the European driving cycle) over the M156, meaning it avoids the US Gas Guzzler Tax for the first time ever, despite having up to 47 horsepower more. The M157's increased torque from both the regular version and performance package means the engine can be shifted into a taller gear sooner, keeping engine revs and fuel consumption to a minimum. The new M157 has an engine start/stop mode and is lightweight at 204 kg. The M157 is said to be ideal for powering full-size sedans such as the S-Class, but the older M156 remains in production, as its more precise throttle response is still well suited to smaller sportier models (the C-Class), until the 2015 model arrives, which is powered by a 4.0 liter V8. 5.5 L V8 BiTurbo models carry the "63" model designation, shared with the 6.2L V8 models. Visually, the 2011 S63 AMG is differentiated from the 2010 model (itself face-lifted over the 2009 S63) by the more angular design of the chromed dual exhaust tips, which also sport embossed AMG logos, as well as new forged wheels. For the CL63 AMG, the new M157 engine coincides with the facelift of the CL-Class for the 2011 model year. Despite common belief, 63 AMG models are typically faster than their 65 AMG counterparts. An S63 AMG accelerates faster and handles better than an S65 AMG (due to 4-wheel drive and decreased weight), and an SL63 AMG accelerates faster than an SL65 AMG due to decreased torque, lower weight, and better balance by use of the V8. Since 2013, AMG models with the S-Model package feature all-wheel drive, which allows for better handling and better acceleration. The Mercedes-Benz CLS63 AMG S has been tested to accelerate to 60 mph in just 3.2 seconds, with a quarter mile time of 11.6 seconds. This made it the quickest production sedan at the time. MotorTrend tested the 2014 E63 AMG S with the M157 engine to produce an estimated 676 bhp (504 kW; 685 PS) and 631 lb⋅ft (856 N⋅m). The models listed below are powered by a variant of the Mercedes-Benz M275 engine. The AMG power-plant has an all-new design of the bi-turbo system, which features larger turbochargers and a new, more powerful charge-air cooling system, and the increase in the engine displacement (to 5980 cc) as well as many other engine design measures. This allows it to produce a claimed 621 horsepower and 738 lb⋅ft (1,001 N⋅m) of torque. "65" models used a 5-speed automatic transmission for a long time, as the newer 7G-Tronic wasn't able to handle the torque from the V12 engines. This was changed with the introduction of 2012 SL65 AMG, which uses the same AMG SpeedShift MCT transmission as the rest of the AMG line-up. Coinciding with the facelift of the CL-Class for the 2011 model year, the 2011 CL65 AMG had an enhanced engine. AMG redesigned the exhaust gas turbochargers and added new engine electronics. It produced 621 horsepower, pushing the car from 0–60 miles per hour (0–97 km/h) in 4.2 seconds (0.2 seconds faster than the 2011 CL63), with an electronically limited top speed of 186 miles per hour (299 km/h). The update also improved fuel economy and reduced carbon emissions by 3.5% over the outgoing model. Launched to the UK market in April 2015, the 4-litre M178 V8 uses an unusual configuration where the position of the intake and exhaust are reversed, to create a more compact engine and hence vehicle design. This "hot inside v" configuration, as AMG calls it, has the exhaust gasses exiting into the central v area of the engine block where the engine's twin turbochargers are also mounted. In addition to the models listed above, there were also predecessors to the current AMG models. The models listed below were powered by a variant of the Mercedes-Benz M275 engine. The models listed below were powered by the M157 variant of the Mercedes-Benz M278 engine. AMG developed its own V8 engine (dubbed M156 in development) for the DTM series. The M156 produces 451 horsepower and 443 ft-lbs of torque. The M156, in various states of tune, was used in models such as the SL63, E63, CLS63, and S63 until it was replaced by the M157 5.5 L Biturbo V8. 2003 UK version of C32 Estate (S203) in Brilliant Silver. Powertrain consists of AMG Speedshift 5-speed automatic transmission mated to an AMG 3.2-litre V6 Kompressor engine with an output of 260 kW/349 hp and 332 lb⋅ft (450 N⋅m) at 4,400 rpm. The engine is a special version of the 3.2 L (3199 cc) M112 E32, fitted with a helical twin-screw supercharger and water-to-air intercooler. The supercharger was developed in conjunction with IHI and features Teflon-coated rotors producing overall boost of 14.5 psi (1 bar). Compared to the standard M112 engine, the AMG version also has a new crankshaft, new connecting rods and pistons, an oil pump with a 70-percent increased capacity, lightweight camshafts, and harder valve springs for a redline of 6200 rpm, an increase of 200 rpm. While rival BMW M developed the SMG II semi-automatic for the BMW M3, the C32 and SLK32 have a 5-speed automatic transmission's “Speedshift” system, which now has quicker response (up to 35 percent) to accelerator and shift selector movements. This model was nicknamed the "Hammer" after the original 1986 AMG Hammer (a W124 E-Class sedan with an AMG-tuned 360 hp 5.6-litre V8). The 2003 E55 AMG could do 0–60 mph in 4.4 seconds. The main engine is a 5.4 L V8 engine This engine comes in two configurations. The first configuration is a naturally aspirated V8 with 354 PS (260 kW; 349 hp) that is used in the C55 AMG, CLK55 AMG, E55 AMG (1999-2002), SLK55 AMG, and ML55 AMG. 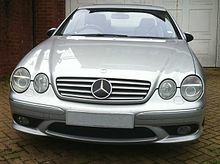 The C43 AMG (model years 1998–2000) was powered by a naturally aspirated V8 engine from the M113 family, but at a reduced displacement of 4.3L, hence the '43' designation. The other configuration is a similar unit but with a highly efficient Lysholm type twin screw supercharger. manufactured by Eaton, is in the rest of the AMG 55 models, which are typically midsized or larger vehicles. The published output according to Mercedes varies from 476 PS (350 kW; 469 hp) to 517 PS (380 kW; 510 hp) and 700 N⋅m (520 lb⋅ft) to 720 N⋅m (530 lb⋅ft), depending on various methods of power measurements and different ECU programming for national legislations. For instance, the E55 AMG's engine was at the low end, nonetheless it was still Mercedes-Benz's fastest sedan at the time, while the SL55 AMG's engine had the top output. Mercedes has claimed that a more restrictive exhaust system was responsible for cutting output on the E55 AMG, however some enthusiasts have managed to bump up horsepower to 505 on the E55 by incorporating some parts from the SL55. The supercharged 5.4 L 24 valve V8 engine was mated to the Speedshift 5-speed automatic transmission, which has a torque capacity of 796 lb⋅ft (1,079 N⋅m), as the newer 7G-Tronic introduced in 2003 is limited to 542 lb⋅ft (735 N⋅m), not enough to handle the torque from the supercharged V8. The V8 S55 AMG had comparable output to the V12-powered S600 throughout their production. The S55 AMG (2001–02) was outfitted with a 5.4 L 354 hp (264 kW) V8 motor while the later versions (2003–06) sported the same motor, but supercharged to a rated 493 hp (368 kW). The S600 (2001–02) was outfitted with a 5.8L 362 hp (270 kW) V12 engine while the later versions (2003–06) sported a twin-turbocharged (or Bi-Turbo) 493 hp (368 kW) 5.5L V12. The justification for having two models with the same power is that the S55 AMG is sportier and more responsive, while the costlier S600 is more luxurious with a smoother ride. AMG phased out both the naturally aspirated and supercharged 5.4 L engines in favor of the new M156 V8 beginning in 2006, which was paired with 7G-Tronic. However, some enthusiasts were disappointed because the M156 produces less torque than the M113K (which is supercharged). The "63" badging was used on the short-lived 2001 S63 AMG, 2001 CL63 AMG and 2002 G63 AMG. These were produced in limited quantities for one month and only offered through AMG to select customers in Europe and Asia, purportedly state leaders. The CL63 AMG was the rarest W215 CL of all, and just 26 examples were built in November 2001 (51 plate), with some UK being and one for France registered in March 2002. These had a base price of £110,000 (~US$200,000). The G63 AMG was the rarest W463 of all with just 5 examples built in September 2002 and sold in Germany at over EURO 250,000 each. These are powered by a naturally aspirated 6.3L V12 producing 444 PS (438 hp/327 kW). This engine is based on the M137 5.8L V12 used in the S600 and CL600, but the AMG variants have a larger displacement, a new management system, a new crank case and cooling system, weight-optimized pistons, and a new camshaft with greater valve lift and modified valves. 390 lb⋅ft (530 N⋅m) of torque are available between 2500–5800rpm with a peak of 457 at 4400 rpm while horsepower grows by almost 80 over the 5.8L V12. It is mated to a 5-speed automatic transmission. The 2001 S63 AMG V12 had 100 hp more than the 2001 S55 AMG, and was a few tenths faster. The Mercedes-Benz SL-Class (R129) had several AMG variants during its production run from 1989 to 2001. The SL 60 AMG was the most numerous of these rare cars. Sold from 1993 to 1998, it used a 6.0 litre V8 engine producing 381 PS (280 kW; 376 hp) at 5500 rpm. AMG claimed a 0–62 mph (100 km/h) speed of 5.6 seconds. Its top speed was limited to 250 km/h (155 mph), but with the limiter removed, it was capable of approximately 185 mph (298 km/h). AMG later unofficially conceded that 0–60 mph,(0–97 km/h) was more like 5.0 seconds and the engine produced between 405–410 bhp. Even rarer is the SL 70 AMG (7.0 L (7055 cc) V12 engine). The "63" M156 is currently in production in the C63 AMG, and tuned as the M159 in the SLS AMG, although there were many models that were previously in production. This naturally aspirated V8 will also be used to replace most of the "55" models. The published output according to Mercedes varies from 457 PS (336 kW; 451 hp) on the C63 AMG, to 525 PS (386 kW; 518 hp) on the C/CLK/R/ML/GL/S/SL/CL/E 63 AMG. The 2008 S63/CL63/SL63s that used the M156 engine at 518 horsepower edged out that of the S600/CL600/SL600, the latter powered by the 510 horsepower 5.5-liter twin-turbo V12, while also having a higher redline. However, the S600/CL600/SL600 are more expensive and have more torque at 612 pound-feet (830 N⋅m). The S63/CL63/SL63 however do have quicker acceleration times than their S600/CL600/SL600 counterparts and are the fastest in the lineup in 2014, due to the added weight and torque of the 65s, thus decreasing the 0-60 times and the handling limits. Compared to the "55" supercharged 5.4 L V8 engine—which was restricted to the Speedshift 5G-Tronic five-speed automatic transmission, as it had a torque capacity of 796 lb⋅ft (1,079 N⋅m)—the reduced torque of the "63" M156 6.2L V8 means it can be mated with the more efficient 7G-Tronic, which can withstand a limit of 542 lb⋅ft (735 N⋅m). Despite the reduction in torque, the increased horsepower and more efficient transmission enables the "63" models to match or surpass the acceleration of the "55" models. Most of the M156-engined models used the 7G-Tronic automatic transmission, however the more recent 2009 SL63, 2010 E63, and 2012 C63 use the 7-speed MCT transmission. The AMG Performance Studio in Affalterbach is responsible for the upgrades that make an AMG into an AMG Black Series model. The Black Series treatment is only available on 2 door vehicles, which includes weight reduction, bucket seats, exterior alterations, interior alterations, higher power, greater traction, handling, and significantly greater overall performance. Black Series models are known as street legal race cars. The SLS AMG Black Series was tested by Motor Trend to have a 0-60 time of 3.2 seconds, and a quarter mile time of 11.1 seconds at 129.8 mph. The SLS AMG Black Series "demolished" the Motor Trend figure eight in just 23.1 seconds, beating the McLaren MP4-12C, Ferrari 458 Italia, Audi R8 V10 Plus, and the SRT Viper. The SLS AMG Black Series is currently the 22nd fastest car to lap the Nürburgring. The SLS AMG Black Series had the same 1:19 time as the Lamborghini Murciélago LP670-4 SuperVeloce, the Ferrari Enzo, and beat the Ferrari 458 Italia, Lamborghini Gallardo LP 560-4, Porsche 997 GT2, and Nissan GT-R around the Top Gear test track. In 2013, Mercedes-AMG announced the SLS AMG Coupe Electric Drive, which was to be the first zero emissions vehicle from AMG. The vehicle used technology derived from Formula 1, and was the fastest electric car. The SLS AMG Electric Drive has 740 horsepower and 738 lb-ft of torque, and Mercedes-AMG claims a 0-60 Mph,(0–97 km/h) time of 3.9 seconds. ^ a b "Statement of Investments pursuant to Sections 285 and 313 of the German Commercial Code (HGB) for the Company and Consolidated Financial Statements of Daimler AG as of December 31, 2011" (PDF). daimler.com. Daimler AG. 2012-02-09. Archived (PDF) from the original on 2012-08-07. Retrieved 2012-02-12. ^ a b "Mercedes-Benz AMG". Retrieved 2014-02-08. ^ "2002 Mercedes-Benz C32 AMG Road Test". Edmunds. Retrieved 6 October 2014. ^ Newhardt, David. "Behind the Scenes: Mercedez-Benz AMG". MotorTrend. Retrieved 2008-03-22. ^ Hall, Jim. "Rhapsody in Red: 500SL AMG" Motor Trend Magazine, October, 1983. ^ "Mercedes-AMG: The AMG Story beginning". Retrieved 6 October 2014. ^ "AMG's Hammer" Auto Week, June 23, 1986. ^ "AMG's new chief has big plans for 2006 - AutoWeek Magazine". Autoweek.com. 2006-01-20. Retrieved 2011-12-06. ^ June 2001 BY PETER ROBINSON. "2002 Mercedes-Benz C32 AMG and SLK32 AMG - First Drive Review - Page 2". Caranddriver.com. Retrieved 2011-12-06. ^ "2009 Mercedes-Benz SL-Class". Autoblog.com. ^ "Mercedes adds AMG moniker to Formula 1 team name". Autosport. 2011-12-05. Retrieved 2011-12-06. ^ "Erebus Motorsport on the V8 Supercar Grid in 2013 name". Archived from the original on 2012-09-27. Retrieved 2012-10-28. ^ "Aston Martin in technical partnership with Mercedes-AMG GmbH". Retrieved 6 October 2014. ^ "Mercedes-AMG GmbH and Aston Martin Lagonda Ltd. to enter technical partnership". 25 July 2013. Archived from the original on 6 October 2014. Retrieved 6 October 2014. ^ "Aston Martin signs Letter of Intent for technical partnership with AMG". Autoblog. 2013-07-25. Retrieved 2014-10-28. ^ a b "Mercedes-AMG: A High Performance Driving Experience". Retrieved 2014-10-28. ^ "All-New 2014 CLA45 AMG 4-Door Coupe". Retrieved 2014-11-06. ^ "Mercedes A 45 AMG: The most powerful 4-cylinder turbo engine in the world - Car Engineer". Retrieved 2014-11-06. ^ "2014 Mercedes-Benz CLA45 AMG First Test - Motor Trend". 2013-11-13. Retrieved 2014-11-06. ^ "CLS63 4-Door Coupe | Mercedes-Benz". mbusa.com. Archived from the original on 2017-06-08. Retrieved 2014-08-02. ^ "SL63 AMG Convertible Roadster | Mercedes-Benz". mbusa.com. Retrieved 2014-08-02. ^ a b "Engines: 5.5L-V8". Mercedes-AMG. 2009-10-14. Archived from the original on 2010-04-11. Retrieved 2010-07-28. ^ a b "Mercedes AMG New Twin-Turbo 5.5 Litre V8 Engine Revealed". Worldcarfans.com. Retrieved 2010-07-28. ^ a b "AMG Replacing 6.3 V8 with 5.5L Twin Turbo V8". Carthrottle.com. 2010-03-01. Retrieved 2010-07-28. ^ "2011 Mercedes-Benz S63 AMG - 2010 Geneva Auto Show Coverage, New Car Reviews, Concept Cars - Automobile Magazine". Automobilemag.com. Retrieved 2010-07-28. ^ "2011 Mercedes-Benz S63 AMG". Canada.com. 2010-07-05. Archived from the original on 2010-08-03. Retrieved 2010-07-28. 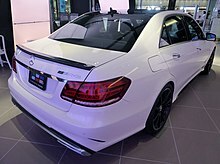 ^ "2012 Mercedes-Benz E63 AMG First Drive". Motor Trend. 2011-07-08. Retrieved 2011-12-06. ^ "2015 Mercedes-Benz S65 AMG Photos and Info – News – Car and Driver". Retrieved 2014-10-28. ^ "Mercedes-Benz SL63 / SL65 AMG Reviews - Mercedes-Benz SL63 / SL65 AMG Price, Photos, and Specs - CAR and DRIVER". Retrieved 2014-10-28. ^ "2014 Mercedes-Benz CLS63 AMG S Track Sheet" (PDF). caranddriver.com. Retrieved 2014-08-02. ^ "Luxury Super Sports Sedan Comparison - Audi RS7, Mercedes-Benz CLS63 AMG S, Porsche Panamera Turbo - Motor Trend". motortrend.com. Retrieved 2014-08-02. ^ PeterH (2009-12-04). "Mercedes-Benz CL 65 AMG and S 65 AMG | Mercedes". 500sec.com. Retrieved 2010-07-28. ^ a b c "Mercedes-Benz AMG 6.3-liter V8". Insideline.com. 2005-07-19. Retrieved 2010-07-28. ^ "Mercedes' new CL65 AMG will now pack 621 horses - Drive On: A conversation about the cars and trucks we drive - USATODAY.com". Content.usatoday.com. 2010-07-24. Retrieved 2010-07-28. ^ "2011 Mercedes CL63 & CL65 AMG revealed". Worldcarfans.com. Retrieved 2010-07-28. ^ "Mercedes AMG GT 2015". askaprice.com. 2014-09-25. Retrieved 25 September 2014. ^ a b "2014 Mercedes-Benz SLS AMG Electric Drive Photos and Info – News – Car and Driver". 2014-09-10. Retrieved 2014-10-28. ^ "2014 Mercedes-Benz SLS AMG Black Series Test – Review – Car and Driver". December 2013. Retrieved 2014-11-08. ^ June 2001 BY PETER ROBINSON. "2002 Mercedes-Benz C32 AMG and SLK32 AMG - First Drive Review - Car Reviews". Car and Driver. Retrieved 2011-12-06. ^ "Mercedes-Benz C32 AMG First Drive – Full Review of the New Mercedes-Benz C32 AMG at". Roadandtrack.com. 2001-07-01. Archived from the original on 2011-10-19. Retrieved 2011-12-06. ^ "2003 Audi S4 vs. BMW M3, M-B C32 AMG". Car and Driver. Retrieved 2014-10-06. ^ "C/D Test Results" (PDF). caranddriver.com. Retrieved 2017-04-30. ^ Kim Wolfkill (January 2003). "First Drives - Mercedes-Benz E55 AMG (1/2003)" (PDF). RoadandTrack.com. Retrieved 2017-04-30. ^ December 2002 BY PETER ROBINSON. "Mercedes-Benz E55 AMG - First Drive Review - Car Reviews". Car and Driver. Retrieved 2011-12-06. ^ "Test Drive: 2004 Mercedes-Benz E55 AMG - Autos.ca". Canadiandriver.com. 2003-10-26. Retrieved 2011-12-06. ^ "2004 Mercedes Benz E55 AMG". Retrieved 6 October 2014. ^ "Mercedes E55 AMG" (PDF). Retrieved 2010-07-28. ^ a b "Mercedes-Benz S63 AMG (W220) - World's Fastest Sedans". Fantasycars.com. 2006-12-14. Retrieved 2010-07-28. ^ a b "MERCEDES BENZ S 63 AMG (W220) 2001 - 2001". autoevolution. Retrieved 2010-07-28. ^ Automobil Revue, catalogue edition 1995, p. 380. ^ "2008 Mercedes-Benz CL63 AMG and S63 AMG - First Drive Review - Auto Reviews". Car and Driver. Retrieved 2010-07-28. ^ "2014 Mercedes-Benz SLS AMG Black Series First Test - Motor Trend". 2013-08-06. Retrieved 2014-10-28. ^ "Top 100 Lap Records | Nürburgring Lap Times". Becker, Clauspeter; Bolsinger, Markus; Clauss, Michael (2013). AMG 45: The Story - The Cars. Bielefeld, Germany: Delius Klasing. ISBN 9783768834940. Bolsinger, Markus (2013). Mercedes-Benz SLS AMG. Bielefeld, Germany: Delius Klasing. ISBN 9783768833707. Clarke, R.M., ed. (2007). Mercedes AMG Ultimate Portfolio 2000-2006. Road Test Portfolio Series. Cobham, Surrey, UK: Brooklands Books. ISBN 9781855207486. Mühling, Frank; Bolsinger, Markus (2006). AMG: Reaching for the Stars. Bielefeld, Germany: Delius Klasing. ISBN 3768818098. Rigatto, Alessandro (2011). Typenkompass Mercedes-AMG Serien- und Rennsportwagen seit 1967 [Typenkompass Mercedes-AMG Production and Racing Cars since 1967]. Typenkompass series; Basiswissen für Auto-Freunde series (in German). Stuttgart: Motorbuch Verlag. ISBN 9783613032736.